Does Jesus Have a God? * We accept Visa and Mastercard, Personal Checks or Money Orders. * To order, just click on the Buy button and add that product to the shopping cart, then click on the Checkout button, fill in your information, select the payment method and submit your order. You'll receive an email confirmation of your order. Products are shipped US Postal Mail. Shipping to Canada and other countries will require additional shipping charges. Paul preached God and Jesus. Each of his 13 epistles began "...peace from God our Father, and from the Lord Jesus Christ." This verse makes no mention of a third person, but they do make a very obvious distinction between God and Jesus! There are over 760 NT passaages that make this distinction clearly.There are written in this book in the order they appear in Holy Scripture, in hopes that Christianity might adjut its DOCTRINE and WORSHIP. Read it and reap! It is a 520 page work filled with scriptural and historical insights regarding the truth of the One Most High God and his supernaturally conceived, virgin born, human son, our Savior Jesus Christ. In my studies I have been astonished to find that according to Edward Gibbon, Will Durant, and other noted historians, Plato was teaching the doctrine of the divine Logos and the doctrine of the Trinity, at his university called the Academy in Athens, Greece, 375 years before the birth of Jesus Christ! To deny the conclusions of these councils which were called by the Roman emperors Constantine and Theodosius, was to be punished by banishment or death. As Thomas Jefferson said, “The Trinitarian idea...grew in the blood of thousands and thousands of martyr’s.” These things I will prove in this book. It is past time to re-examine those doctrines in the light of Holy Scripture! Should We Pray To God The Father or Our Savior Jesus? -Consider these words of Jesus our Savior regarding prayer: "When ye pray, say our father which art in heaven." (Luke 11:2). ~ "When thou prayest...pray to thy Father..." (Matt. 6:6). ~ "Your Father which is in heaven (shall) give good things to them that ask him" (Matt 7:11). ~ "...that whatsoever ye shall ask of the Father...he may give it to you" (John 15:16). ~ "And in that day ye shall ask me nothing. Whatsoever ye shall ask of the Father in my name, he will give it to you" (John 16:23). 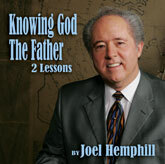 Joel Hemphill writes: "Often the enemy has blinded us to the clear instructions given in Scripture regarding prayer, and then caused us to blame God in our hearts when our prayers went unanswered." Is the Holy Spirit A Third Person of God? - Is the Holy Spirit pictured in Scripture as a separate and distinct 'person' of God, or the breath and power of God the Father Himself? The Bible has much to say on this important subject! To God Be The Glory - Examining The Bible View of God. Who is the Lord God of the Bible? Find the answer in the pages of this exceptionally inspiring book! But is Jesus God? The Bible answer may surprise you! Click to read an excerpt. If you are a minister, click "here". To God Be The Glory-German Version - Examining The Bible View of God. Who is the Lord God of the Bible? Find the answer in the pages of this exceptionally inspiring book! But is Jesus God? The Bible answer may surprise you! This version is written in the German language. Shipping to Canada and other countries will require additional shipping charges. You will see the total shipping charges at checkout. To God Be The Glory Teaching Series - A pastor of a large church in the Nashville area asked me to come and teach on the subject of my book, "To God Be The Glory." This set includes 7 C.D. 's of these teaching sessions. They run from forty-five to sixty-two minutes and are packed full of Scriptural understanding regarding God our Father, the one Most High God, in relation to His virgin-born Son, our Savior Jesus Christ. Please purchase, listen and be blessed. Knowing God The Father - 2 Lessons on the subject of the One Most High God, as taught in Holy Scripture. This CD-set is taken from the “”To God Be The Glory” seminar held in Monroe, Louisiana. There were various denominations in attendance from eight states and Germany. This is a true story regarding the first eighteen years of a boy’s life, who lived and found love in a village in Northeast Louisiana. 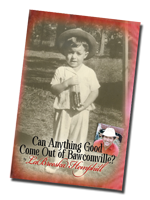 That boy is Joel Hemphill, and the village is Bawcomville. His life was honest and simple, yet rich with people, adventure, and the business of living. Such a strong foundation helped launch him into a successful life of ministry. The Hemphills: Partners In Emotion - A moving book written by LaBreeska Hemphill; read and be inspired by The Story of God's Grace in the Lives of Joel & LaBreeska Hemphill. My Daddy Played The Guitar - LaBreeska Rogers Hemphill, pastor's wife - mother - singer - author - has a story to tell that spans over six decades and includes an interesting and diverse cast of characters. LaBreeska draws on her treasury of life experiences to write this entertaining and inspirational book. These are stories from her life, but the impact will be life-changing for many. ©2008 Trumpet Call Books. All Rights Reserved.